The responsibilities of an Automotive Digital Marketing Manager will vary from dealership to dealership. Regardless of the size of your company you work for, your future employer must outline the responsibilities of your job so that a clear job description is created. Without a clear job description, it will be difficult for you to actively participate in your annual performance review. If a detailed job description is not presented, offer to create one based on the questions provided below. What is my job title (more important in larger organizations)? Who is my direct manager? What level in the organization is he/she? What experience does this person have with digital marketing? What are my areas of responsibility? Ask for a detailed list or talk through them to make a list. For example, specific projects, campaigns, or programs that you will manage. How many employees will I have to manage (for larger organizations)? What vendors will I responsible for managing? Request a list or build one based in inspecting their current marketing budget. Will I have the ability to approve marketing investments? Up to what dollar amount? How will my performance be measured and who will evaluate my performance? If my performance tied to financial bonuses? If yes, what is the compensation plan? How long will you guarantee this plan will not change? What reports am I expected to generate and how often? Does the organization want paper or electronic reports? What are my work hours in the office and work hours outside of the office? What are the travel requirements and travel reimbursement policy for this role? Do you have a flexible work from home policy? How much money per year will be allocated for continuing education, conferences, workshops? What are the benefits that come with this job (healthcare, 401K, profit sharing, life insurance, dental, etc.)? Your employer may not want to get into specifics on how your performance will be evaluated each year, but you will need to understand the goals that will be set for your work. By asking the above questions, your job description will accurately document the responsibilities that were communicated when you were hired. Define the performance metrics that will be part of your annual review. Be as specific as possible, so that your expectations and those of the dealership executive team are in sync. Each year your job description may need to be edited to reflect new opportunities, technologies, and responsibilities. Don’t ignore this step! Having an outdated job description does not help you or the business. Take time to understand the executive team structure at the dealership and whom you will report to. Does the executive team have the ability to mentor you in your career or will you be the only person on staff that understanding the technical nature of digital marketing? An experienced Automotive Digital Marketing Manager doesn't need much hand holding but a green pea will struggle to find success without competent internal support. If your dealership works with an outside advertising agency, ask who will manage their engagement with the dealership. If you are going to be responsible for the marketing strategies and investments of the organization, you need to have an active role in creative direction for the business as well. You will also need to ask who manages vendor partners such as website providers, e-commerce technology, chat services, SEO, SEM, and video marketing. Inquire if the company has a data warehouse for centralized reporting. Ask if there are documented Key Performance Indicators (KPI) for each vendor that was hired. The more you ask upfront the easier it will be to set realistic expectations for your boss. A divided house will not stand, so make sure you understand all the line items on the marketing budget and ask who currently controls those investment decisions. It is not unlikely to find marketing investments that are “islands” of their own, controlled by an executive in the business. For example, a friend of the owner manages the direct mail campaigns, and they often discuss strategy without anyone else from the company involved. Be respectful of existing relationships but don’t be afraid to discuss the importance of a centralized role for marketing decisions. So what did I miss? What questions would you add to the list so that an accurate job description and compensation plan can be prepared and approved? Let's make sure you understand that these steps should be taken BEFORE you accept an Automotive Digital Marketing Manager role in a new auto dealership! Great article. I wish I had this list of questions when I was interviewed for my previous Digital Marketing Manager position!! For anyone in the agency space looking to move into the auto industry... be forewarned. Working in the auto industry is like nothing I have ever experienced in my career and this article sums it all up with a great list of prequalifying questions. My advice? Don't take on a Digital Marketing Manager position with a dealership (or auto group) unless you have a contract. Make sure the contract states everything because one you get hired, they will try to change everything from right under you. Brian, I am in this position at my dealer group. I am the first person that has ever done this here so we do a lot of writing the manual as we go. I think that what you have presented here is great stuff and I am going to go ahead and put together a job description using this as a guide. I also look forward to reading your book. Please make sure to let me know when it is available, I would be honored to be one of the first owners of it. Again, great stuff! Thanks Brian, yes and I post the graphic a lot. 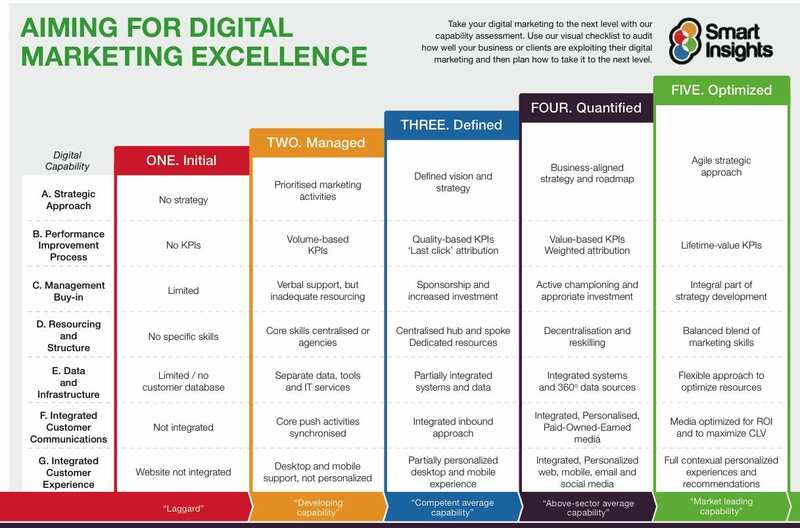 When someone here posts, "hey, check out this social media stuff or wow, if you have internal HQ problems read this..." I usually post, please take a look at http://www.smartinsights.com/digital-marketing-strategy-guide (regardless of it being outside of automotive niche) in order to understand what you need. There are far too many dealerships that have absolutely zero digital marketing strategies in place (I know I worked at a huge dealer with none) and that's my strongest point. WHAT DO YOU NEED IN ORDER TO GET THERE? Good stuff here, Brian. Truth is, if dealers don't already have the answers to these questions, they are likely putting the cart before the horse by hiring someone. Debra, thank you for your feedback and I do have additional research and recommendations for DMMs at smaller dealerships and single point stores. This article is an an excerpt from my upcoming new book "Mastering Automotive Digital Marketing." The first chapter is a deep dive into the foundations for success which includes a proper job description, understanding the support you will have/not have from the executive team, how to communicate your work and progress to management, managing your time, marketing checklists, and vendor management tips. I'll post on ADM when it is available for sale, and all of the comments on the post have been very helping in refining and adding some additional commentary to this section. Alexander, that is a great graphic. Do you have a link to the original source? "How can you make a judgement about hiring when you don't understand the position your are trying the fill?" BINGO! Exactly, I couldn't agree more Tom and one of the reasons I walked out on the job. I couldn't handle it anymore. Literally, I walked out on a high paying job, with two five year old twin sons, a wife and baby on the way, with NO new job lined up or in sight.